Aaron Scott can’t stop winning since leaving Notts AC to join Lincoln Wellington. Two weeks after a convincing victory in the Folksworth 15, the Stamford-based speedster won Sunday’s Stamford 30k for the third successive year. The race, which will celebrate its 25th anniversary next year, is one of the most popular events on the local road running calendar and athletes travel from far and wide to test themselves over the Lincolnshire hills as their spring marathon training intensifies. As if the up and down nature of the course was not enough for the runners to contend with, a freezing east wind and driving sleet turned the race into a real battle against the elements. 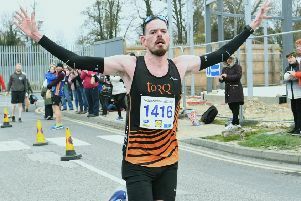 Neither the hills or unfriendly weather could deter Scott though, as he crossed the line in a time of 1:39.56, giving him an enormous winning margin of some eight minutes over runner-up Steven Horton of Bedford and County AC. Bushfield Jogger Brian Corleys had a fine run taking third place in 1:51.07. The 42 year-old was also first veteran home. Several other locals came in under the two-hour mark and Yaxley Runner Matt Launch was delighted with his 10th place finish and time of 1:55.10. Host club Stamford Striders had two sub two-hour men in their ranks. James Skinner finished 14th in 1:56.15 and Jim Morris was two places further back clocking 1:56.40 and taking the prize for first Over 50 man. James Borrett of Eye Community Runners and Nene Valley’s Mike Chapman completed the race in 1:59.27 and 1:59.58 respectively. Philippa Taylor was unable to repeat her 2015 victory on the roads that she regularly uses for training. Nevertheless, the 49 year- old’s clocking of 2:03.39 was a fine effort, given that a long-term achilles injury has severely curtailed her ability to run long distances, resulting in her having to markedly reduce her weekly mileage. Folksworth 15 winner Suzie West had to content herself with a seventh-place finish with a time of 2:07.11. Nene Valley multi-eventer Sean Reidy collected his first medal of 2017 when taking third place in the British Masters Pentathlon Championship at Lee Valley on Sunday. The 36 year-old, who is perhaps best known for his prowess over the hurdles, competed strongly in all five disciplines, winning a thrilling 1,000m in 2:50.41 and finishing as runner-up over the 60m high hurdles in 9:07. Reidy’s team-mate and arch rival Adam Fidgett was also in action finishing fifth.